Today is the first day of the 2015 AFL season. I barrack for the Richmond Tigers, so this post is about Bengal tigers. These massive cats can grow up to 3.2 metres long and weigh up to 325 kg, making them the second largest sub-species of tiger, behind the Siberian tiger. The males are much larger than the females. Bengal tigers live in forests by themselves and need large areas with lots of prey to thrive. They are excellent hunters, carefully sneaking up on their prey until they get close enough to ambush them. They catch large mammals, including sambar, chitals, gaurs, buffalo, wild boar, takins and barasingha. There have also been rare examples of them attacking and killing Indian rhinoceroses and Asian elephants. They are also very dangerous to people and are known to kill people, especially when they live near villages. These magnificent animals are the national animals of India and Bangladesh. Bengal tigers are the most numerous of the tiger sub-species, but they are still endangered and there may be less than 3,000 left in the wild. They are found in India, Bangladesh, Bhutan and Nepal. They have been impacted by poaching and habitat loss. 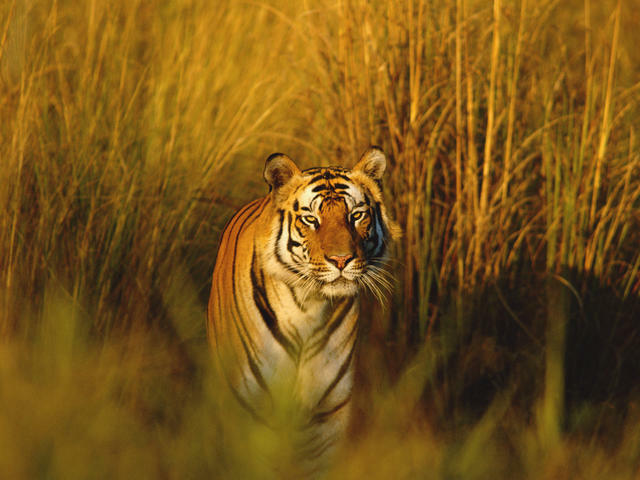 Are there any interesting facts that you would like to share about Bengal tigers?